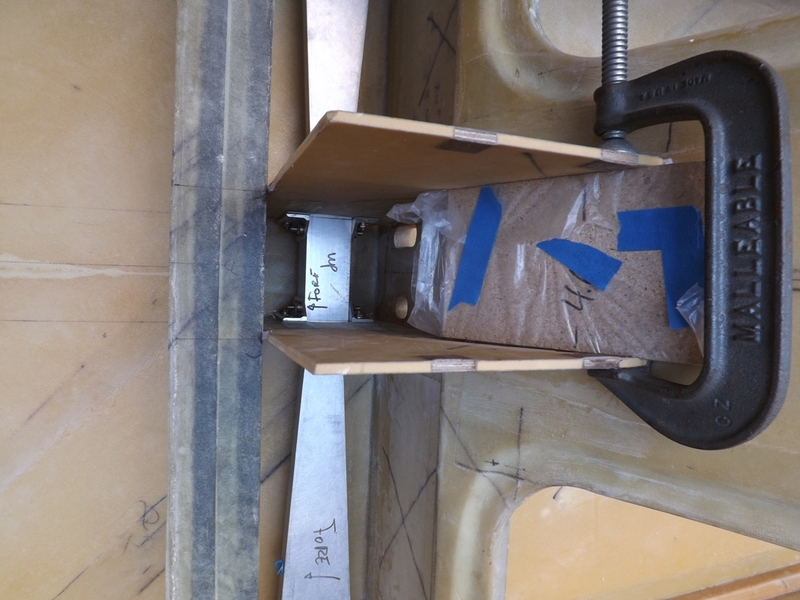 In the past two weeks we have been working on mounting the landing gear brackets on the fuselage sidewalls and making and installing the center landing gear bracket. This work has turned out to be more complicated than we expected. One of the challenges of building a prototype aircraft from a new design is that we are having to figure out some pretty complex assembly processes so that we don’t “paint ourselves into a corner”. So far we are pretty happy about the design of the landing gear mount. We will be able to install and remove the landing gear fairly easily, although I hope that we won’t ever need to do that. The other good thing is that the gear mount bolts will be easy to inspect. 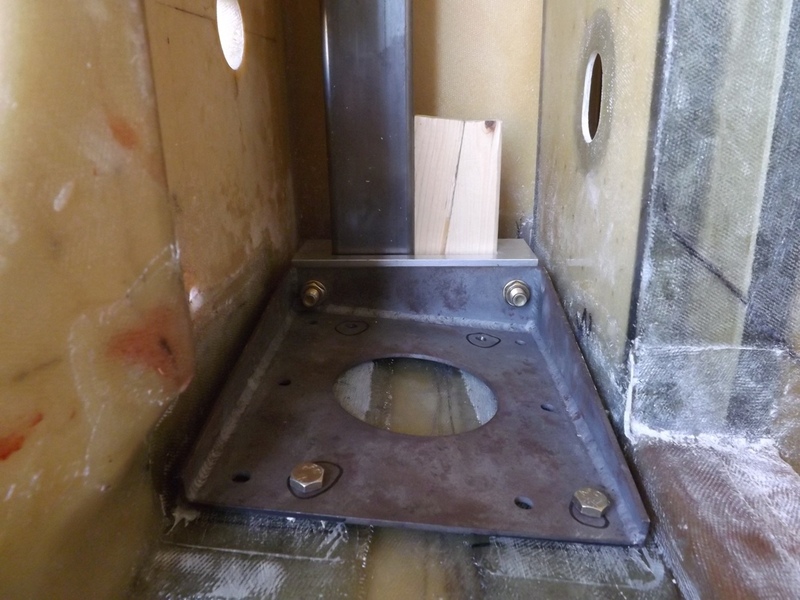 Below are some pictures of the landing gear brackets, the center bracket, center console side plates and the fuselage. image. skin of the fuselage. the two landing gear legs pointing up. gear brackets are installed. This week we continued to work mainly on the landing gear mounting brackets. The steel landing gear brackets will be bolted to the inside side skins of the fuselage. 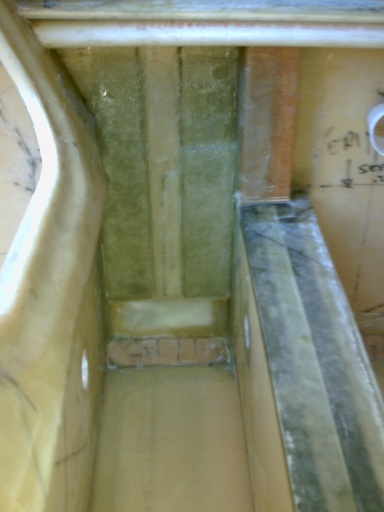 We made four 21-layer thick fiberglass pads so that the stresses will be transferred to the skin, seat back bulkhead and main spar. This is the strongest area of the entire airplane. 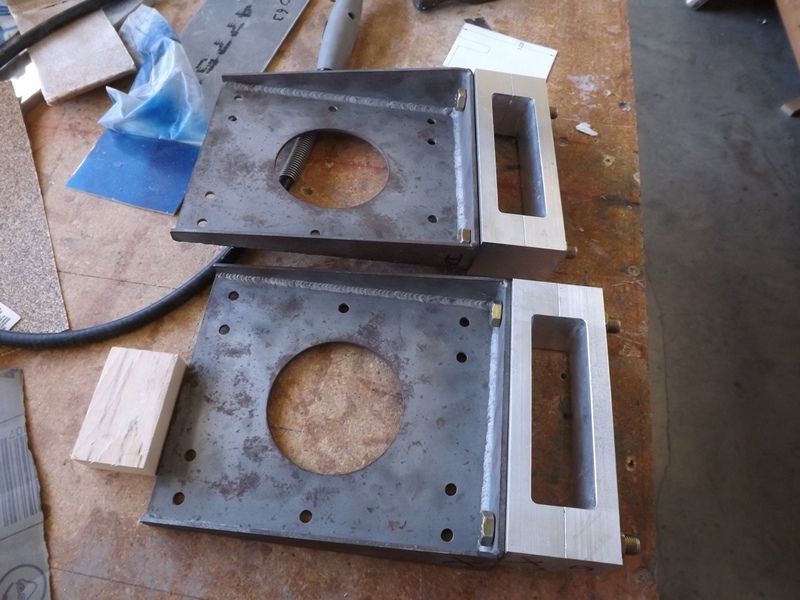 We also worked on the mounting brackets for the rudder pedals. 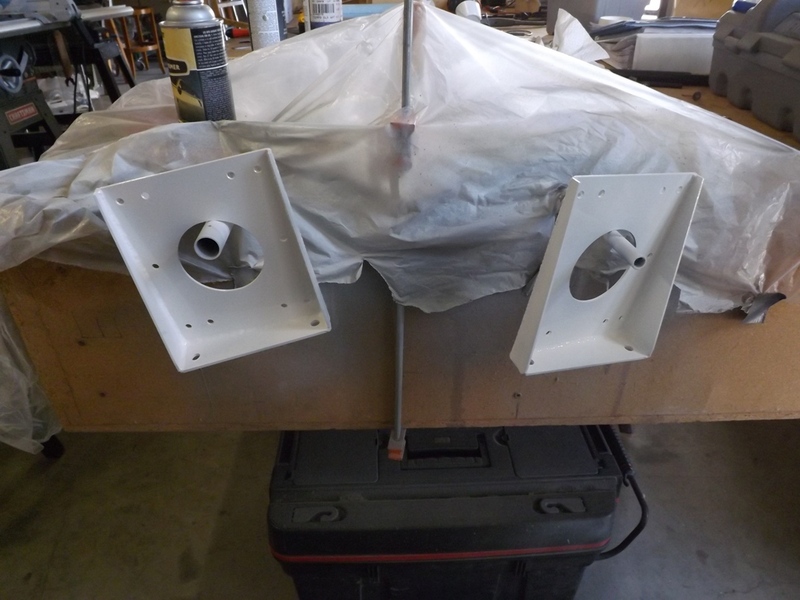 We used a four and a half foot long 1″ x 2″ rectangular steel tube and wooden wedges in order to position the starboard landing gear bracket accurately against the mounting pads. several holes were then drilled through the side skin and several bolts were inserted in order to position the bracket while the rest of the holes were drilled. It was critical that both brackets were accurately located relative to each other so that the landing gear will be straight. Here are the two steel landing gear brackets awaiting bead-blasting. The bracket on the left has been bead-blasted. The two brackets after priming and painting. Ready to install after the paint dries completely. This is how the rudder pedals will be mounted in the forward fuselage. We created mounting brackets in the inside skins. 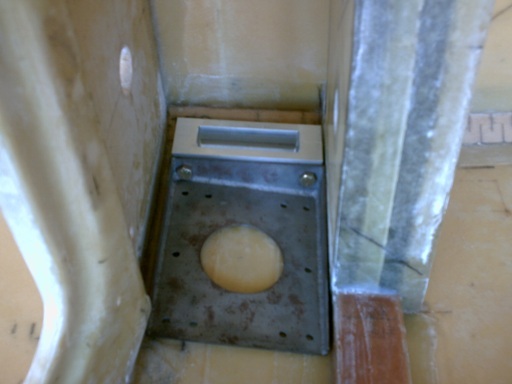 Nylon bearing blocks will be bolted onto the brackets on both sides. 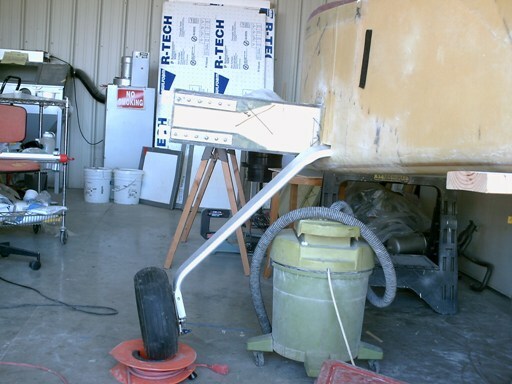 Over the past week we have been working on the landing gear mounts and building a stand so that we can rotate our fuselage which will make it easier to work on. The fuselage is mounted to our pivots. Chuck is sitting by the firewall. The two vertical, parallel and green rectangles in the top center area are the mounting pads which are made up of 15 layers of glass. They are on top of 6 layers of glass covering the entire area between the bulkhead on the left and the spar on the right. The image has been rotated so that the bottom of the fuselage is down and the left side of the airplane is at the top or back of the photo. The notched piece of wood in the center, is the longeron where the side joins the bottom, and just above that is a lighter rectangle which will be cut out so that the landing gear leg can pass through. This week we finished adding all the reinforcing glass to the inside joint between the spar and the sides of the fuselage. 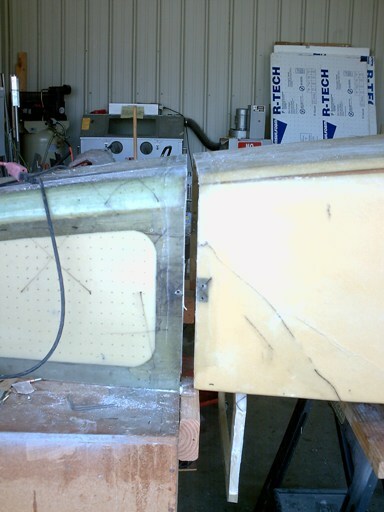 Three layers of bi-directional fiberglass were added to help transfer the stresses from the spar into the fuselage sides. Next step will be to start making the pads for mounting the landing gear brackets. 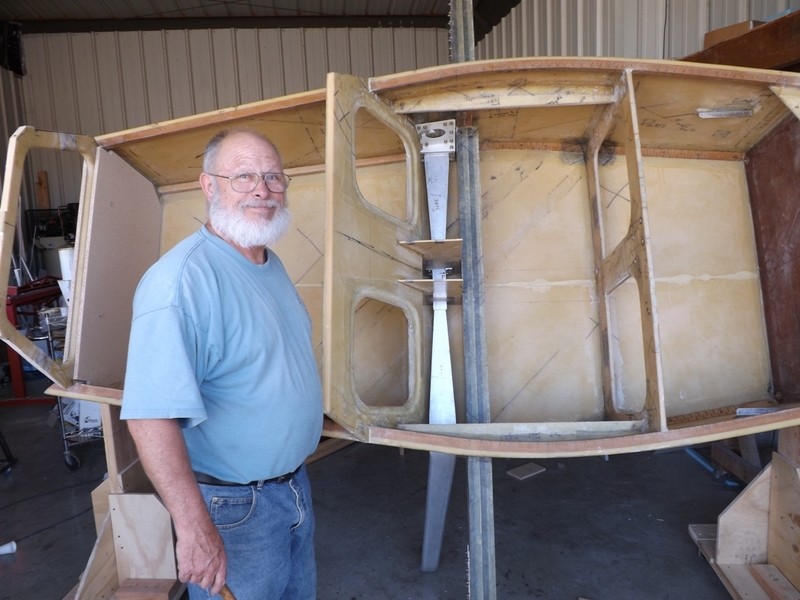 Chuck has been busy finishing the design of the new horizontal stabilizer and elevators. We plan to start making them next week. One big event occurred this week when our canopy arrived from Aircraft Windshield Company! 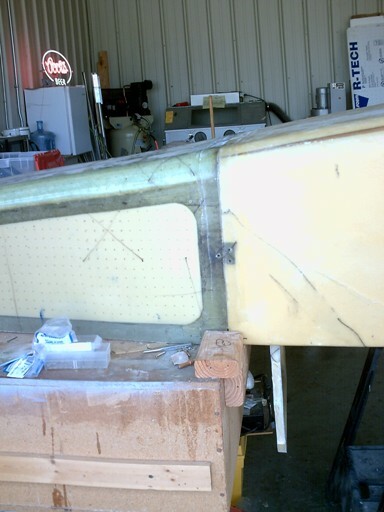 View of the area where the spar goes through the fuselage side skin. The plane is on it’s side and the left side is down. 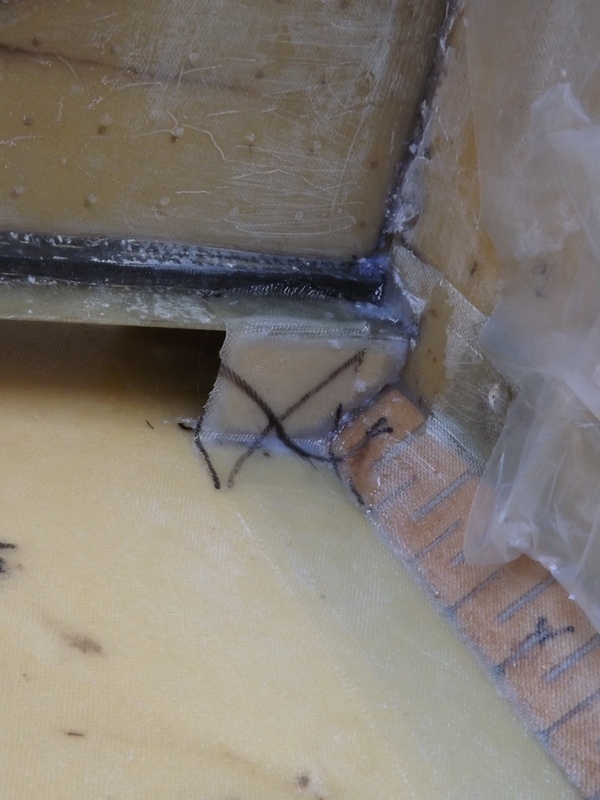 There is a rectangle of glass (with polyethylene plastic backing still attached) laid onto the joint. 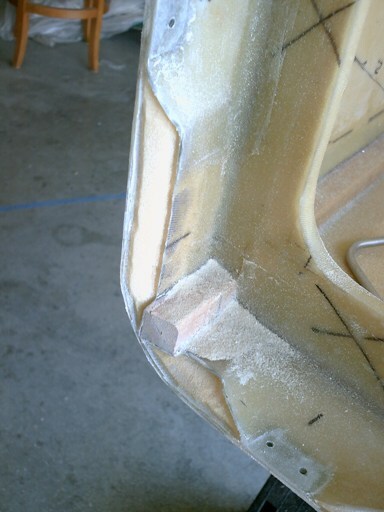 The plastic just helps us handle the fiberglass so that it does not get too distorted as we position it at the joint. We put 3 layers of glass over all joints. This image shows where the main landing gear bracket will go. The bottom of the fuselage is at the top of the picture. The bracket is to the left of the main spar, so when the airplane is turned right side up, the brackets (and the landing gear) will be just behind the main spar. 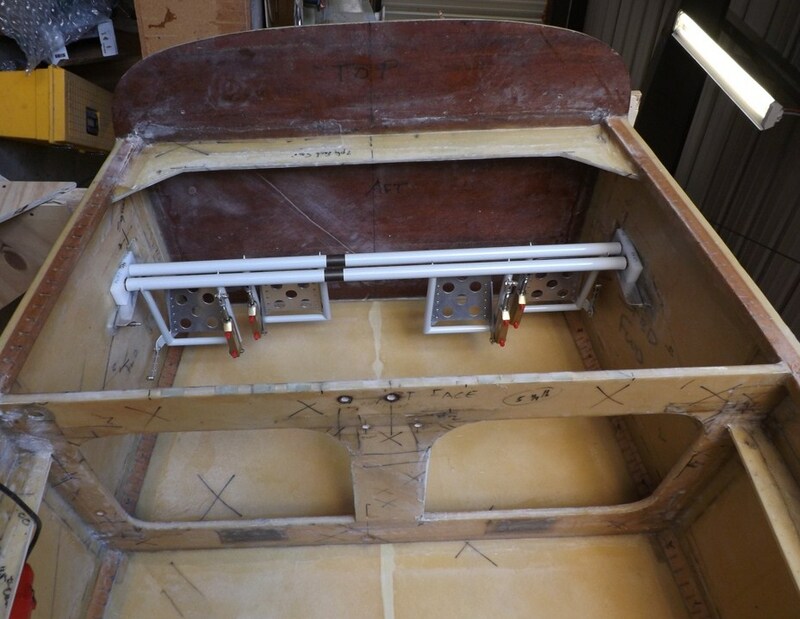 Next week we will be adding a bit of foam and a lot of glass layers onto the skin to form a mounting pad so that we can bolt the support bracket onto the fuselage. The most exciting event of the week was the arrival of our canopy! Aircraft Windshield Company of Los Alamitos, CA made it for us. It is basically a Dragonfly canopy that has not been trimmed. 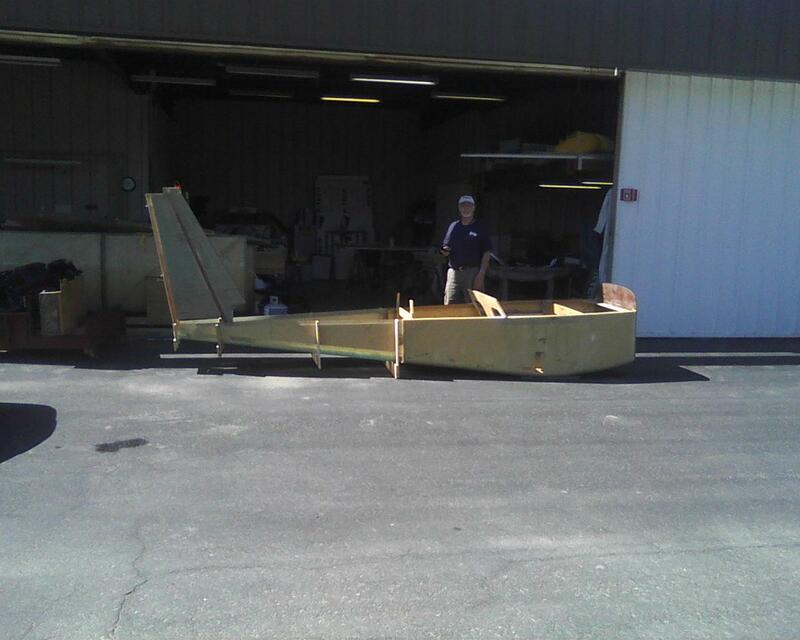 We will leave the protecting craft paper on it until we are ready to make its frame and mount it onto the fuselage. We hope to start working on it in about a month. Here is a view of the hanger showing large pieces of our airplane. The wings are on the left and the fuselage halves are on the right. 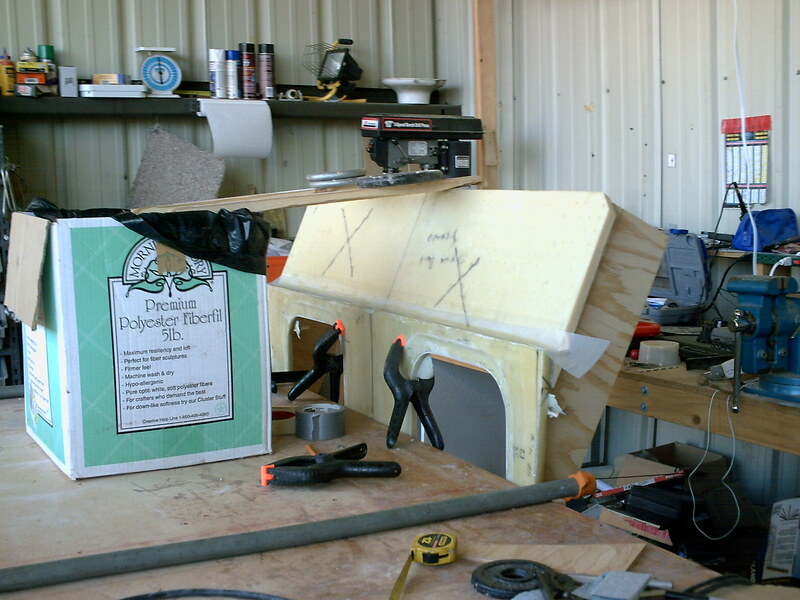 The aft fuselage is sitting on the work table towards the back while the main fuselage is on it’s right side sitting on sawhorses. The curved sills, between the seat back and the instrument panel were given extra unidirectional glass this week to make them extra stiff. This view is of the right inside skin where the main spar intersects. I will be adding a little spacer in the corner area. 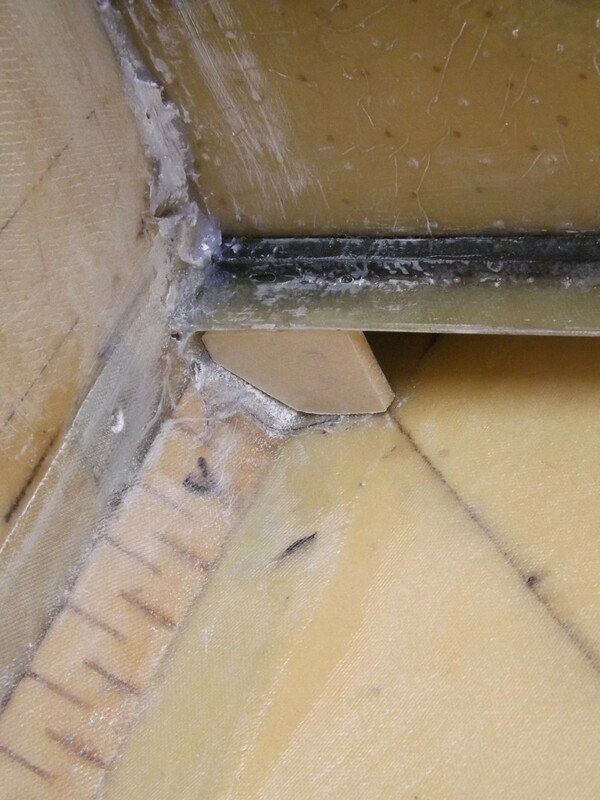 Here is one spacer (1/4″ last-a-foam with 1 ply bi-directional glass on each side) cut to fit. Next step will be to “flox” into place. Here is the spacer on the opposite (port) side, floxed in place. 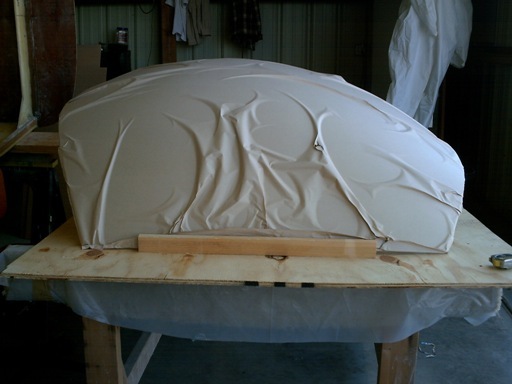 I have added a single ply of fiberglass cloth which goes over the inside spar cap, spacer and bottom skin. Here are the main landing gear mounting brackets with their clamps bolted on. The steel mounting brackets will get bolted to the inside of the fuselage and the landing gear legs will get clamped in place. Well, it was just a couple of weeks ago that we attached the aft lower fuselage to the main fuselage and yesterday we cut them apart! 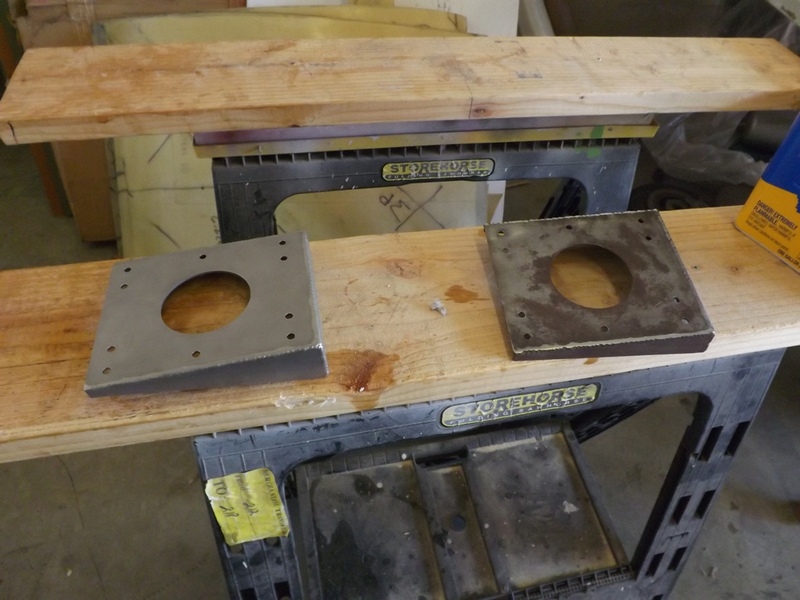 However, in the meantime we made the mounting plates and the strong pads that they bolt to. We can now re-attach the two halves whenever we want to. Below are “before” and “after” pictures. 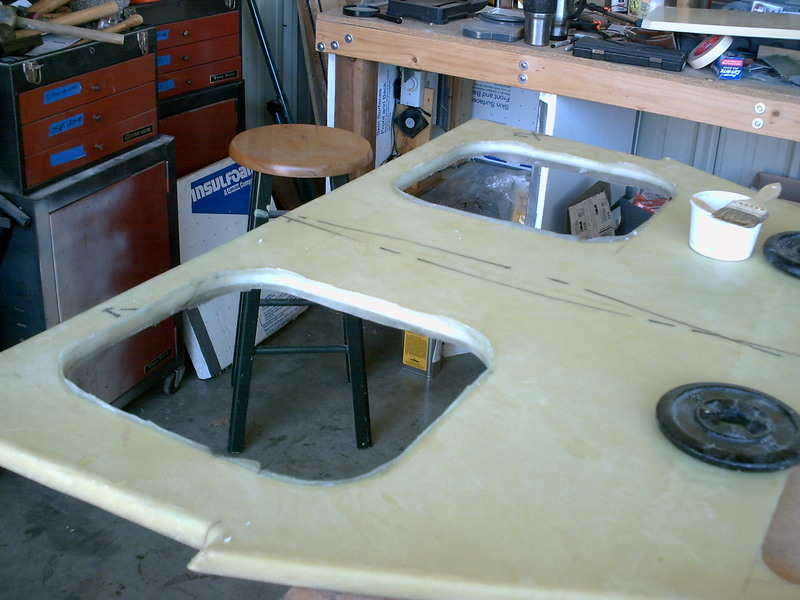 The joined fuselage’s aft portion is sitting on the edge of our work table. The main fuselage is to the right and is supported by a sawhorse (not shown). 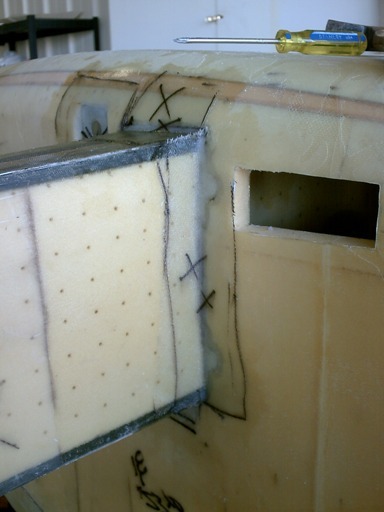 The light areas are where last-a-foam panels are embedded between the inner and outer fiberglass layers (these add stiffness to the fuselage). The dark green band between the front and back fuselage sections is the front edge of the aft fuselage. We have added extra glass to stiffen this area. In addition, the little rectangle with 3 holes in it, sticking out to the right is an extra thick pad where a fuselage attachment tab will be bolted. We have cut apart the two fuselage halves. Note that we cut the pad in half as well. 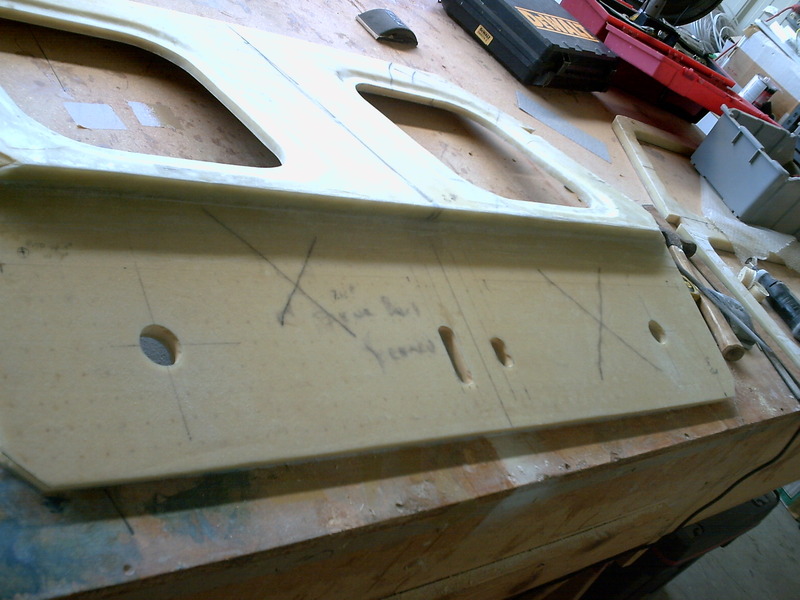 We will bolt the the fuselage attachment tab onto that side with two bolts. 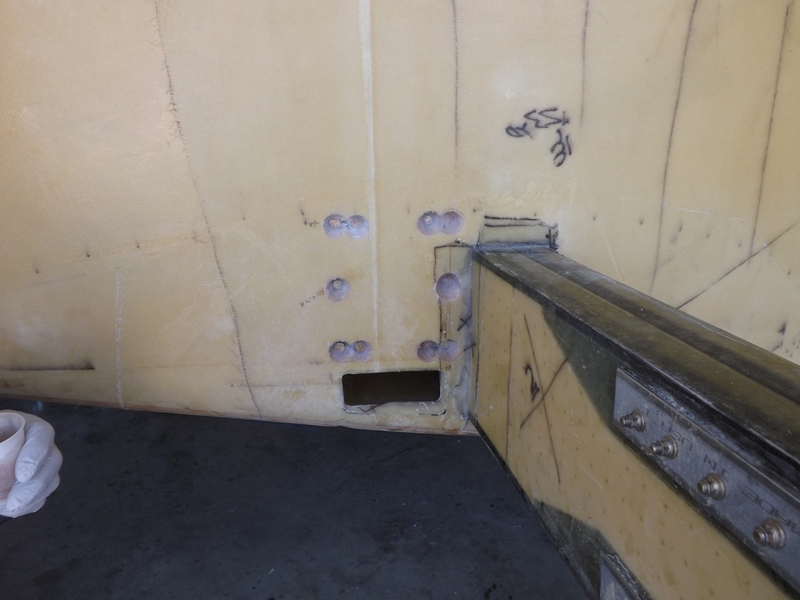 Then when we are ready to re-attach the aft fuselage, we will screw it on by putting a machine screw through the aft skin and into a hole on the attachment tab. 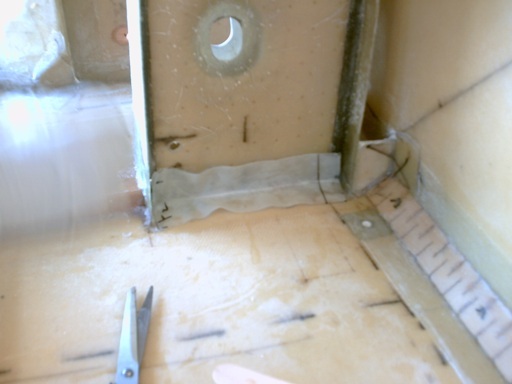 After separating the two fuselage halves, we cut a 45 degree bevel on the main fuselage’s back edge and sealed the edge with flox and fiberglass. This is called a “flox corner” or “flox edge”. In this picture, the main fuselage is sitting right-side-up and we are looking at the bottom port-side corner. The glass and foam has been cut back at 45 degrees to form a bevel and the foam has been cleaned away from the edges of the glass with a Dremel wire wheel. 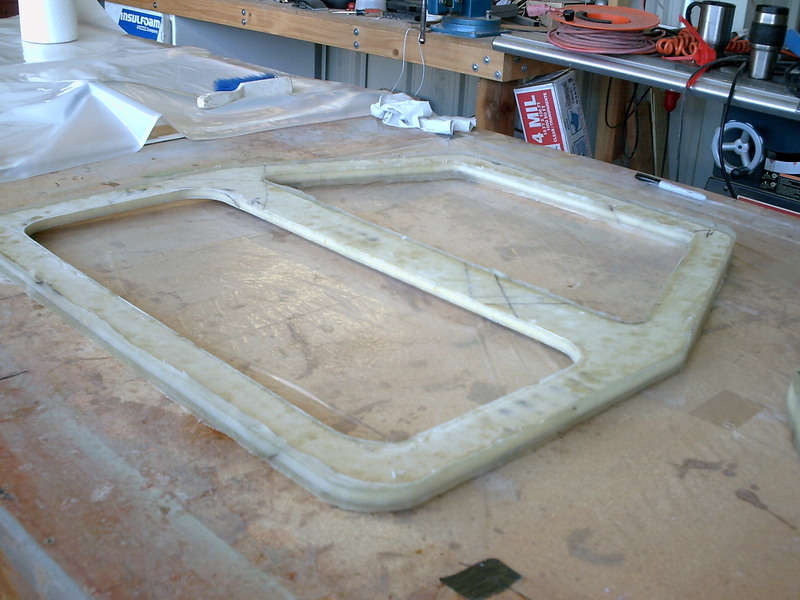 Next we will wet the glass and foam with resin and then cover with a mixture of cotton fiber and resin (flox) followed by two layers of fiberglass (see the picture below). 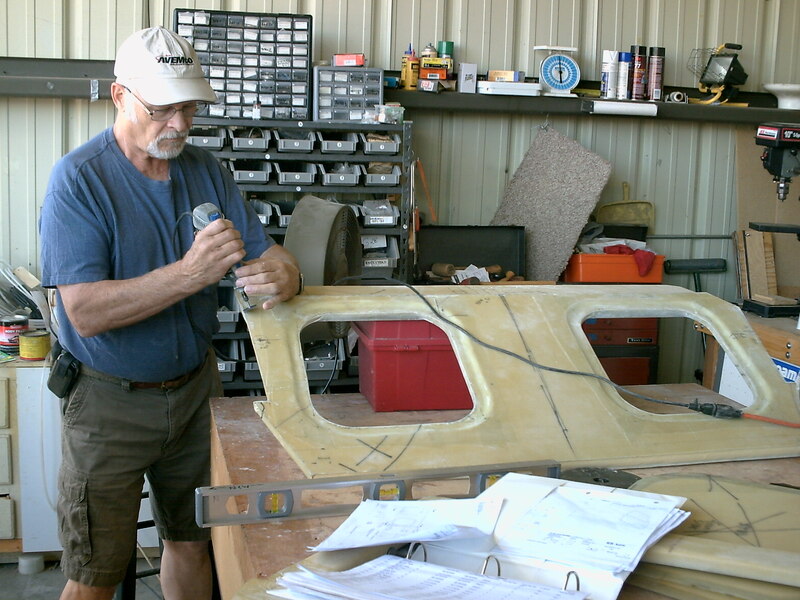 Chuck is adding two plys of fiberglass over the beveled and floxed area. Once the resin cures, we will trim off the excess glass and we will have a nice strong beveled edge. The last thing we did today was the addition of 3 layers of unidirectional (UNI) glass on the inside and bottom of the sill, and inside surface of the fuselage side, between the seatback bulkhead and the instrument panel. This gives that area extra compression strength. I don’t have a picture of this yet, but will post one tomorrow. We are continuing to make steady progress on the airplane. Last week we attached the center spar to the main fuselage. is seen protruding from the side of the fuselage. gear to see how cool it will look! on the left is part of the main fuselage. Yesterday, we fitted 8 of the 9 fuselage mounting tabs onto the fuselage. These aluminum tabs will eventually allow us to be able to attach and detach the aft fuselage from the rest of the airplane. This is a view looking at the area where the aft fuselage joins the main fuselage. The plane is laying on its side, so the bottom tab is actually on the port side and the one on the left of the photo is a bottom tab. 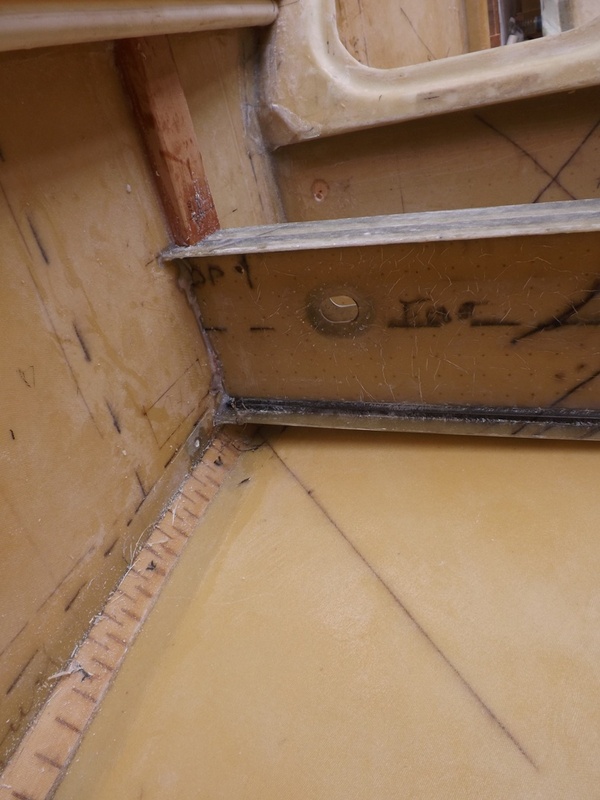 We used some flox (cotton fiber mixed with epoxy resin) to “bed” the plate and then used bolts and nuts to tighten and hold the plates in position until the resin hardens. Eventually, we will remove the plates and then cut apart the aft fuselage and main fuselage. Then we will permanently re-attach the plates to the main fuselage with the two sets of bolts and nuts. More about this in future posts. 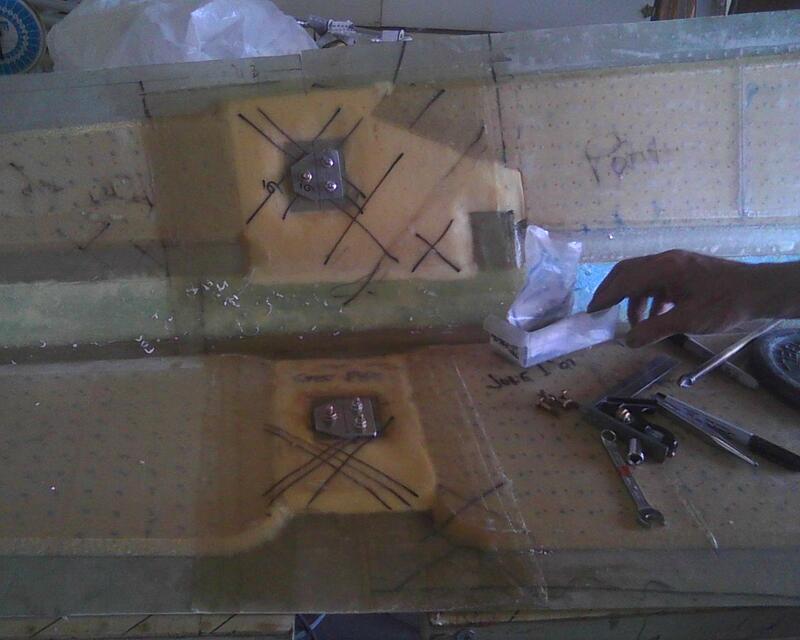 Here are two fuselage mounting tabs bolted into place on the top fuselage skins. 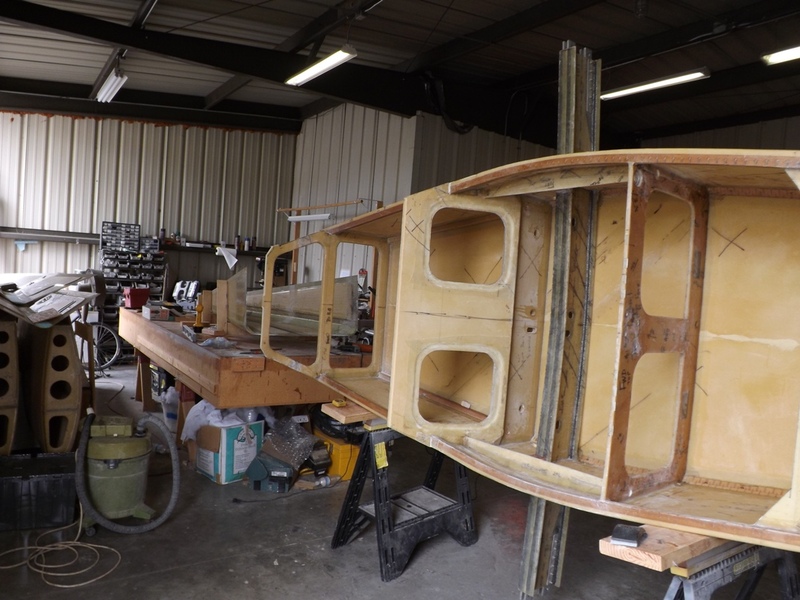 The aft fuselage is on the left and on the right is the area that will eventually become part of the main fuselage (the turtle deck behind our seatbacks). 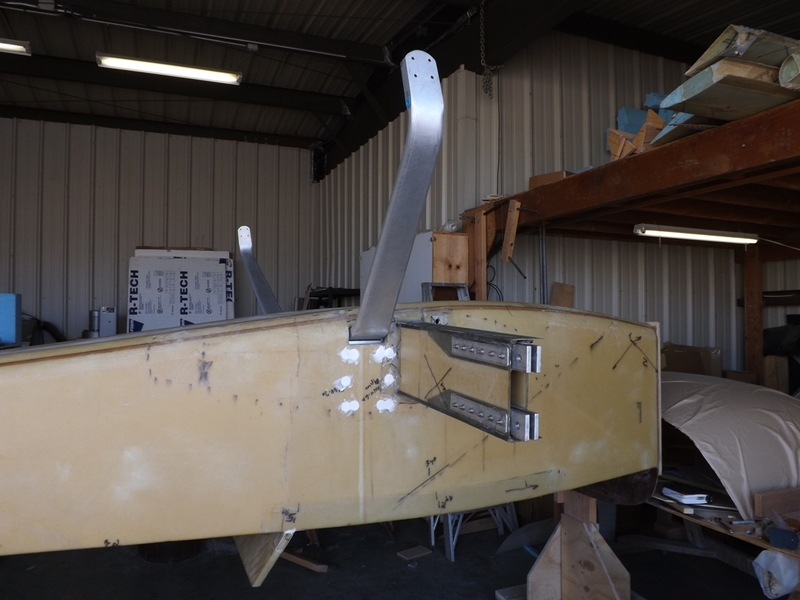 We linked the lower aft fuselage and the forward fuselage together last week. 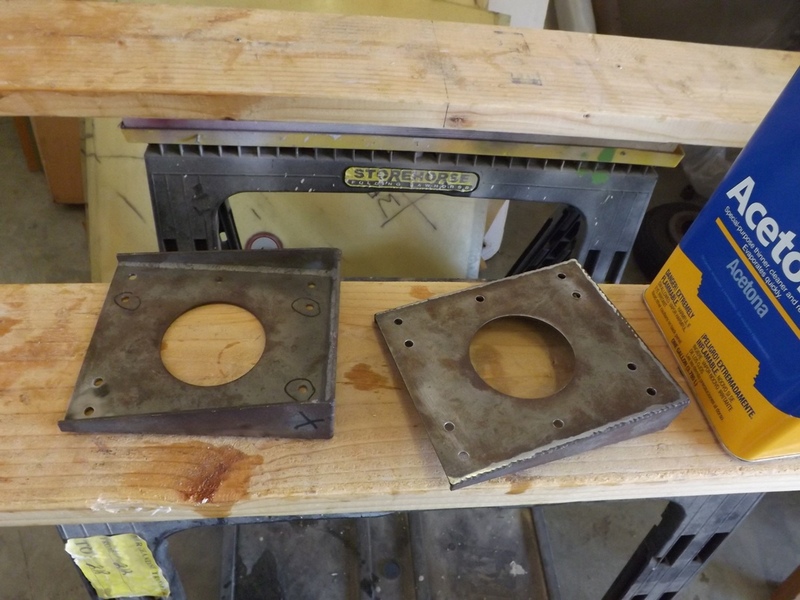 This week we are making the mounting pads and plates that will be used to hold them together and to take them apart for transport or to work on them. Chuck standing behind the fuselage at Hanger 115. We set the vertical fin on the aft end of the fuselage because it looked much cooler that way! May 9, 2012. I just wanted to show some pictures of some of the activities leading up to the wing test in September. 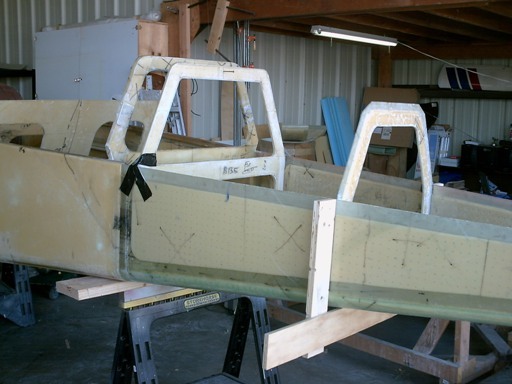 I will be following up with our more recent work on the forward fuselage. 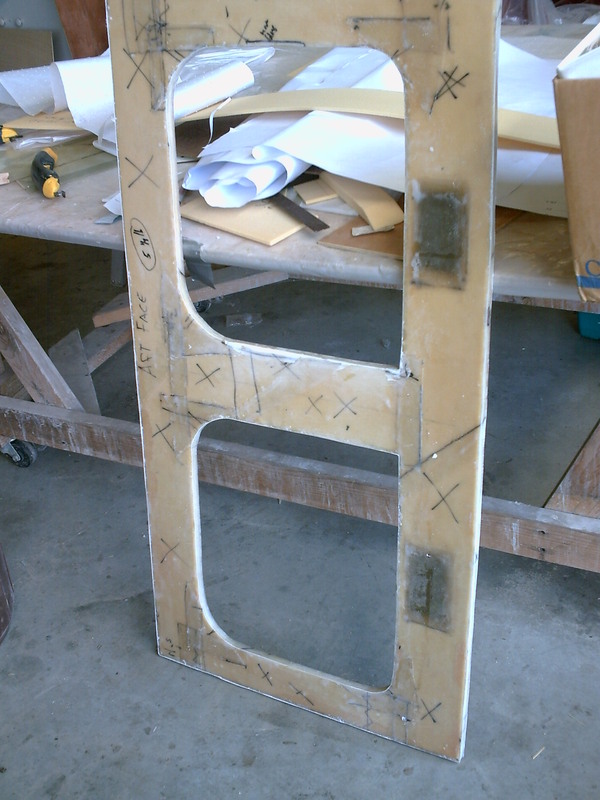 One important first step in assembling the main fuselage was to put together the seatback bulkhead. 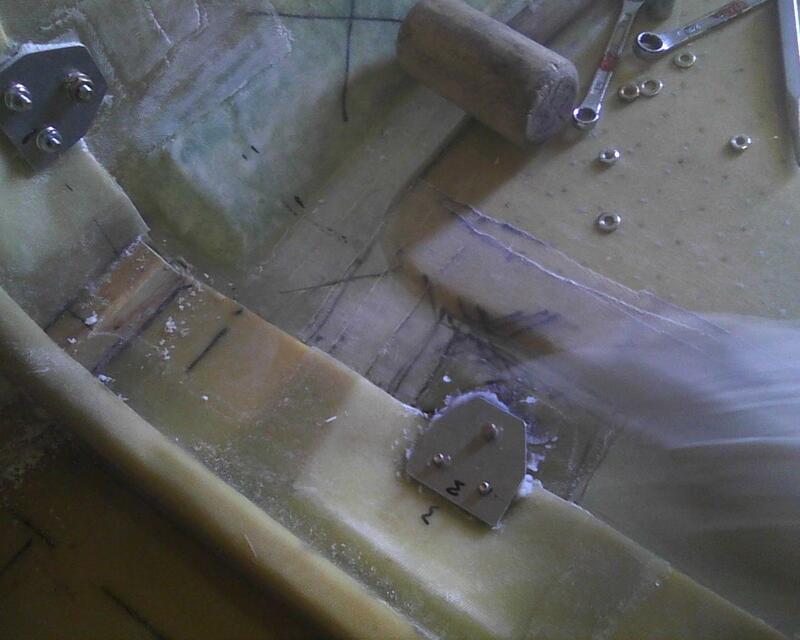 Here we are putting “flox corners” and glassing the inside edges of the two cutouts on the seatback. We will have access to our luggage area through these two holes. 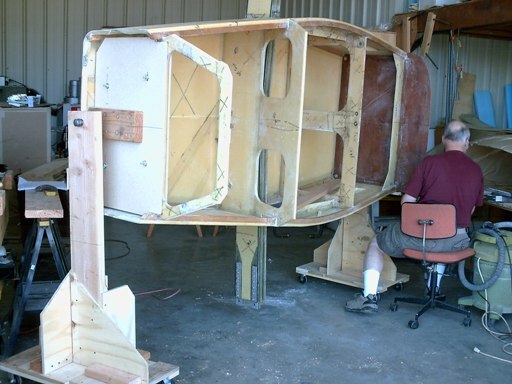 Here we are attaching the lower seatback bulkhead to the upper bulkhead (which was illustrated in the first image above). The seatback is angled back for comfort. 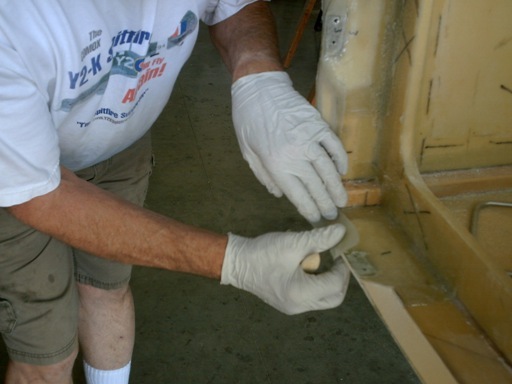 Here Chuck is trimming the fiberglass after it has cured. Here is another view of the seatback bulkhead. Notice the small cutouts on the lower bulkhead to allow the elevator pushrods to pass through. 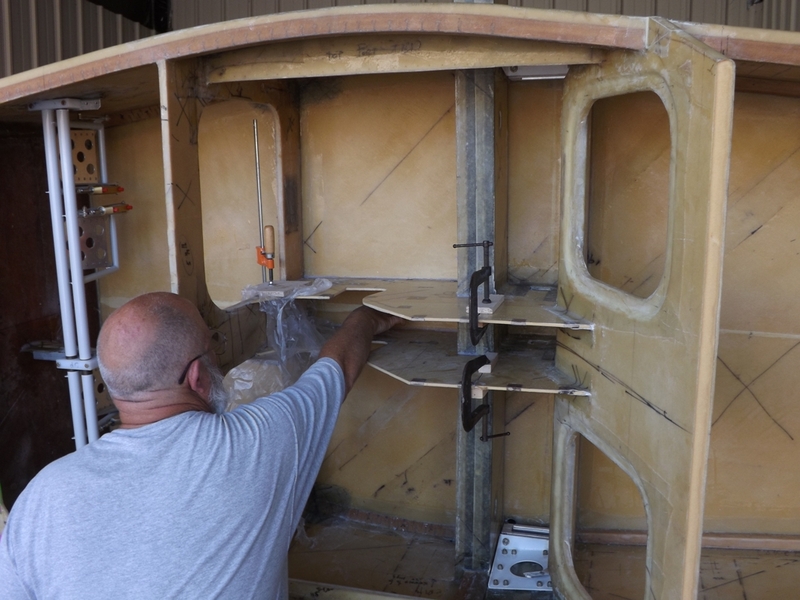 Besides the seatback bulkhead, we also worked on finishing the rest of the bulkheads that will be used in the forward fuselage. 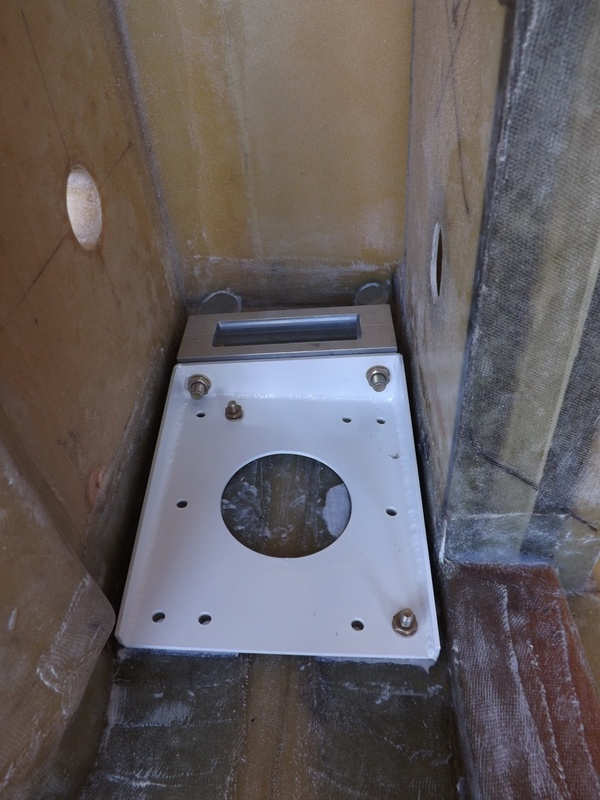 Such as this one (Bulkhead128) which will be located a couple of feet behind the seatback bulkhead. 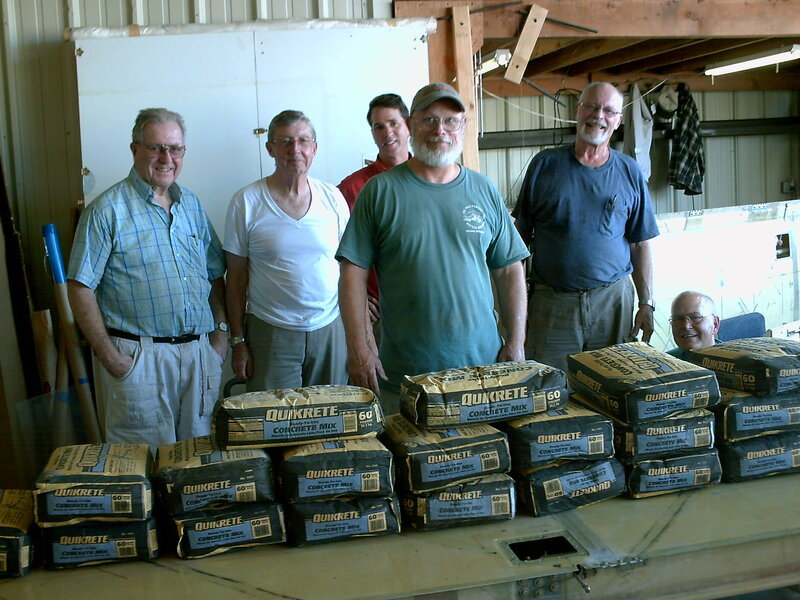 As mentioned in an earlier post, on September 19th we tested both wings and the center spar by placing 27 bags of concrete (1,620 lbs) on them to see if they would bend but not break. Great news, they both bent a little over 6 inches but they didn’t break! Next we begin building the forward fuselage! It has been a long time since I have posted an update on our project. 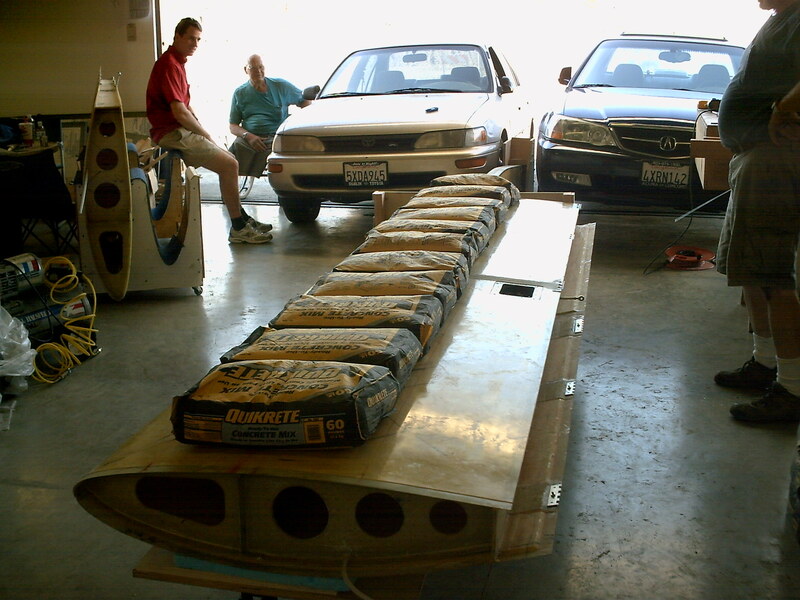 In a nutshell, we assembled both wings, and have finished making all the bulkheads and the panels for the center console. Our next phase is to begin making the main fuselage. But first we needed to load-test both wings!!! The tests were performed with the wings upside down and and 1620 pounds of concrete bags were laid down along the length of the wing. First we built two support frames, one to hold down the center spar on one end and the other to support the opposite end. Next a wing was bolted to the end of the center main spar and the wing tip was supported by a jack on the other. 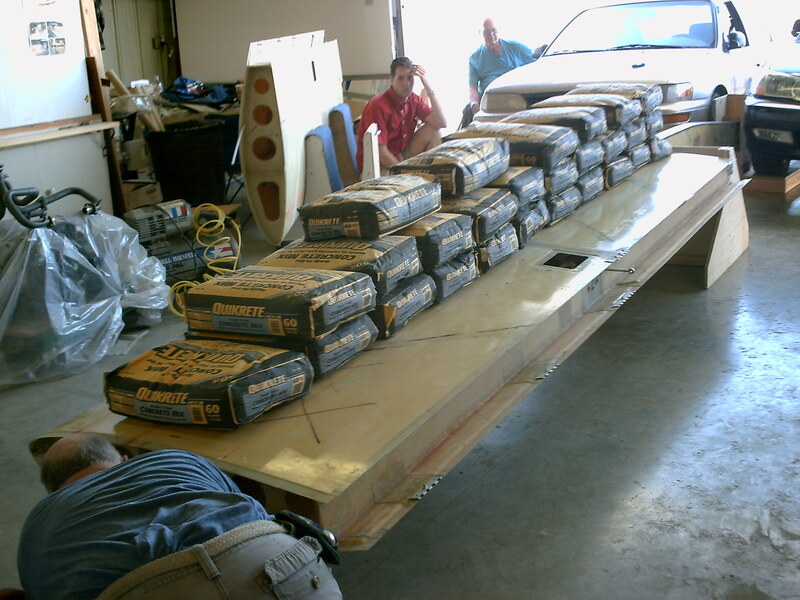 We placed 27 bags of concrete, weighing 60 pounds each on a wing. After that we slowly lowered the jack until the wing tip was no longer supported. Both wings deflected down nearly 6 inches, but did not crack or break. They both passed the 4 G test! Here are a couple of pictures from the test. The two cars are holding down the far end of the center main spar. of concrete. 16 more bags to go! took the picture). To say that we were relieved is an understatement. Now we are ready to begin building the fuselage.